Stuck in traffic on a jam-packed motorway? Find out how thousands of ‘secret signs’ are waiting to guide you through the gridlock. Designed to map unplanned diversions when a section of motorway is closed in an emergency, these ‘secret’ signs are in fact ’emergency diversion routes’ – symbols that are ready and waiting to spring into action and help drivers find their way through unfamiliar roads and back to the motorway. Read on to find out how they could be used to help beat the jams at any time and cut through the congestion to rejoin the motorway system ahead of the hold-ups. What are ’emergency diversion route’ symbols? Ever seen those black ‘shapes’ on yellow backgrounds looking rather out of place on regular road signs? See if you can spot one on the sign above. Despite a popular myth that they’re a secret code directing government bigwigs to the nearest nuclear fall-out shelter, they are, in fact, emergency diversion route symbols. What do they do in their day job? 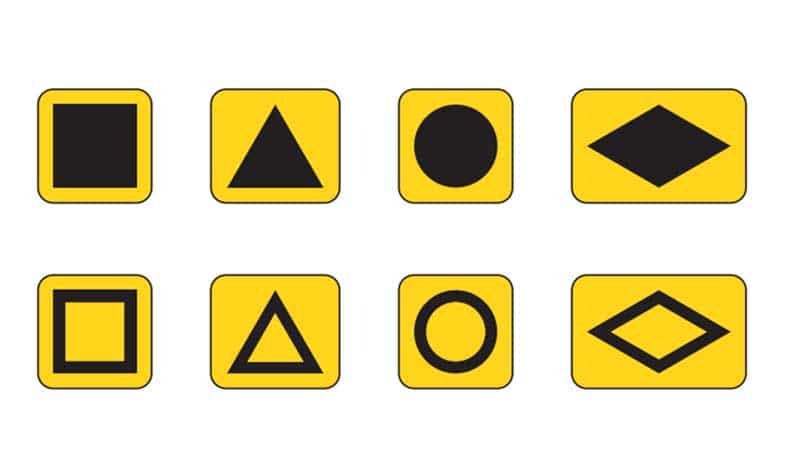 If a section of motorway – or other main artery – needs to be closed in an emergency, these symbols – which are permanently attached to road signs – can step out of the shadows and map a route for drivers to follow to dodge the closure and rejoin the motorway at the next clear junction. A number of different symbols are used, because in some places there would need to be more than one diversion operating. This could be because of low bridges or routes to other motorways if the closure was near a major intersection, for example. Where are they on the motorway? If the motorway is open, you may not see too many of the signs. However, when a section of motorway is closed, a folding sign will be opened telling drivers to leave the motorway and showing what symbol to follow. These ‘trigger’ signs are close to all junctions, but you’ll only see them when opened up in the event of an emergency closure. Are all the symbols the same? The symbols will always be black on a yellow background, but could be a solid or filled square, triangle, circle or diamond shape. They will be located on regular road signs as indicated at the top of this page. See above for examples of the eight types of symbol to for. How can they help me dodge congestion when the motorway is still open? The signs are always visible on road signs even when the motorway is fully open. All you need to do is leave the motorway and look for the first sign with a symbol on it. following this exact symbol will then take you on a carefully chosen and pre-planned route to the next junction of the motorway. If it’s still congested, you can carry on following the next symbol as the system ‘daisychains’ across the network. However, in a few cases, where there is more than one possible diversion, you might need to do a quick spot or web-based research to ensure you follow the right symbol. Read on for details. How to work out the correct symbol to follow when when using them to avoid jams? Whenever there is an incident causing a motorway to be closed, Highways England will contact local media and online traffic resources to pass this message on – they will often detail which symbol or symbols drivers will need to follow between junctions. Simply type something along the lines of the following into Google – replacing details with your motorway and junction. “Emergency diversion route symbol m25 junction 9”. You can also use Twitter to find large amounts of information. Simply search a hashtag like this, wit your motorway and junction included. You should then receive historical data on previous incidents and the symbols that drivers were told to follow. The symbols are permanent on signs, so it’s unlikely this information will change. Remember, don’t use your mobile phone while at the wheel – and stopping on the hard shoulder is for emergencies only and can lead to conviction it’s misused. Either pre-plan your trip by searching before you leave, or let a passenger do it for you. Isn’t this what my sat-nav is for? True – but sat-navs don’t have the expert local knowledge available to local authority planner who spend a lot of time plotting and honing these routes to find the optimum alternative for various types of traffic. Avoiding town centres, low bridges, congestion hot-spots etc – compared with this, your sat-nav could be a rather blunt tool. Is there a list of the emergency routes making them easier to follow? Sadly, there is not such a list available for public consumption. A freedom of information request was issued, but refused due to cost of creating such a database (quoted as £600). Please note: Follow these signs at your own risk.. It is not possible to guarantee they will always be faster than remaining on the motorway.